Track vacation and sick time - vacation tracking is easy with our time off tracking program. As any employer knows, employees can be hard to keep track of. The more you have, the worse it gets! One of the most time-consuming and frustrating tasks involves the tracking of time off and benefit hours earned. It would be relatively simple if every employee would just work the same hours every single day - never getting sick or going on vacation or working overtime. Alas, that is rarely the case, and someone really needs to stay on top of things and know who's doing what and when. And in today's economy, we all need to be as productive and efficient as possible. This is when TimeOff can be a real life-saver. With TimeOff, it is surprisingly quick and easy to track vacation and sick time. This time off tracking program helps you manage time off and benefit hours earned. It is accurate, fast and easy to use, and will keep you up to date with the minimum amount of time and stress. You'll be pleased to discover that it is flexible enough to adapt to the rules of your business rather than the other way around. With a drag-and-drop interface, tracking vacation and sick time is quicker than ever. A benefit policy wizard helps you enter your company benefit policies, and the main screen lets you keep track of benefit hours for each employee. As well as enabling you to track vacation and sick time, this time off tracking program also lets you create a number of useful reports. You can create a Time Off Taken Report, which prints out all the time off entries for the selected employees for any date range, in detail and summary formats. 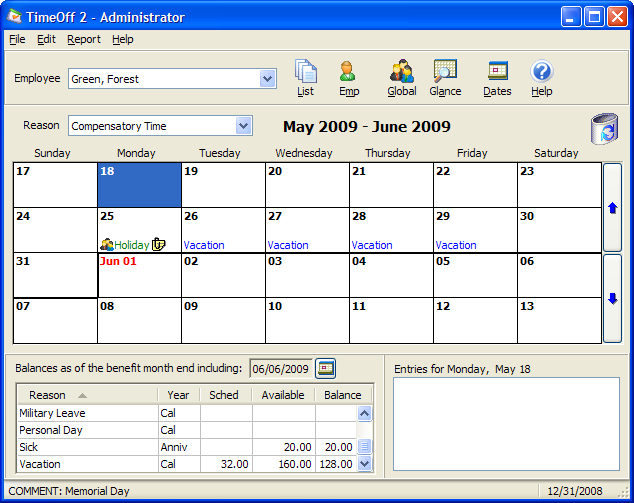 The Month Calendar Report lists time off entries in calendar format for easy reference. The Time Off Balances Report shows benefit hours taken, earned, and the remaining balance for any point in time. And there are many more reports, each with multiple selection options. Start keeping track of vacations and sick time today! Click here to try our free 45 day trial, or better still, buy a fully licenced copy of the software, starting at $99.95. Click here for a full-size version of the main screen of our time off tracking software.